Okay, so here's the deal. I was thrilled when the author offered me an ARC for this book in exchange for an honest review. 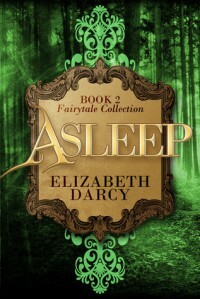 After all, I loved the first book in the series, [bc:The Eye of the Beholder|14743130|The Eye of the Beholder|Elizabeth Darcy|http://d202m5krfqbpi5.cloudfront.net/books/1338486518s/14743130.jpg|19239194], so I was certain that I would love this one, too.I didn't. *cringes*Here's what I struggled with:-Not sure why, but I anticipated that it would be 1st person POV - like the first book. It's not. 3rd person narrative, and not much emotional internalizing by the MCs. Very difficult to connect with them.-Not much world-building involved. There were too many assumptions made in the authoring, and I struggled to picture the social heirarchy. After all, the heroine seems to be a warrior, and heir to her father's throne, and the hero is laid back and the heir to his father's throne. Is this normal? I dunno. It didn't 'seem' like there were other female warrior types around, but there was nothing to elaborate on this, at least, not at first. It took too long for this to be explained.-Awkwardly placed flashbacks about the development of their relationship (I'll get to that - the relationship - shortly). Typically, I'd expect something currently taking place to relate to the flashback and they didn't really seem to. Also, the transitions back and forth between current events and the flashbacks were jarring, and not well defined. Sometimes the only way I realized that I was reading a flashback was because I knew the the hero/heroine were doing something else that didn't flow with what I was reading. Like I said. Jarring.-Ah-yes. The relationship. I didn't think I would have an issue with the 're-imagining' of Sleeping Beauty, but I did have a problem with the hero basically being the submissive and the heroine being the 'knight in shining armor.' This may be something personal on my part, I'm old-fashioned to some extent, I guess.Based on the above reasons, it took me forever to get through the book. I found it far too easy to set down, and very difficult to pick back up.I wish I could give this a better review, and I hope that the next book in the series is more like the first.